to the factory Service Manuals. The Inboard water pump is mounted on the engine. It is usually down low in the bilge on the front lower starboard side of the engine. The Raw Water pump should be rebuilt every season. The Water Pump is belt driven. It has two hoses attached to the rear housing. One hose is the water intake hose and the other feeds to the engine. Mercruiser has made some changes to the pump design and method of mounting through the years. Early Raw Water pumps such as those on the old 340 or 7.4L Inboards and TRS model engines used a "clamp-style" bracket which clamped to the nose of the pump. Later styles used a cast bracket to which the pump mounted to on the front side of the pump housing. Later on came the stamped steel brackets which are still used today. Early fuel injected and carbureted engines mounted the mechanical fuel pump to the side of the water pump housing. If you have a fuel pump mounted to your water pump housing special care must be taken to avoid damage to the fuel lines while servicing the water pump. In short... you will loosen and remove the fuel lines and take the entire water pump assembly off of the engine with the fuel pump still attached. More on this later. To service the Raw Water Pump it will have to be removed from the engine along with its bracket. It's a fairly easy job although restriction to access can make removal and installation difficult. First remove your boats battery as so the engine won't crank and injure you. I know, it sounds corny but just do it. Stick your head down into the bilge and take a close look at how the two hoses attach to the back of the water pump rear housing. If you accidentally reverse these hoses when installing the pump, you will ruin your new impellar. Label both hoses and draw the configuration on a note-pad so that when you go to reassemble the pump to the engine you won't get the hoses reversed. Be aware that if you have the boat in the water that when you remove the hoses from the pump that water might start rushing into the bilge. Never leave the boat once the pump is disconnected unless you have clamped a plug into the intake hose to prevent the boat from sinking. Look to see if you have a fuel pump mounted to the side of the water pump. If you have a fuel pump mounted to the side of the water pump, you will have to shut off your fuel supply at the fuel tank. Failure to close off your fuel tank could result in damage, injury or death. I know... it sounds corny but just do it. Once your fuel valve is closed and you know that you have already removed the battery from the boat, it is safe to proceed. Use a good 3/4" Flare Wrench and loosen and remove all the metal fuel lines. This will allow you to remove the water pump with the fuel pump still attached. The pump is mounted to the engine with one Main Bracket and one Brace. The Main Bracket is mounted to the front face of the pump. It also bolts to the front of the engine block with two bolts. Older Vee-Belt equipped engines had the Main Bracket had a slot in the lower bolt hole which allowed the pump to swivel in and out to tighten the belt. Newer engines with tensioner pulleys and/or Serpentine Belts did not need the slotted Main Bracket. The Brace is about 1" wide and flat. It bolts to the bottom of the water pump and usually passes under the front of the engine and bolts to the front of the block. This brace gives the pump a little more support. Earlier braces were slotted to allow the pump to swing to adjust and tighten the water pump belt. If the water pump has it's own belt, it will have the slotted Main Bracket and slotted and adjustable lower Brace. Use a slotted screw driver or a 5/16" nut driver and loosen the hose clamps that hold the large fat thromostat hose in place. Remove the hose. This will give you better access to the Main Bracket's mounting bolts. READ THIS: The upper Main Bracket bolt may be located just behind the Circulation Water Pump. Depending on what model engine you have, you may or may not be able to remove this bolt without first removing the Circulation Water Pump. The Circulation Water Pump is the wide metal pump bolted to the middle of the front of the block. It is held onto the block with 4 bolts. The upper Main Bracket bolt might just barely clear the Circulation Water Pump. Some do and some don't. I suggest that you try to remove this bolt FIRST. If it won't clear the metal Circulation Water Pump, you will simply have to remove the Circulation Water Pump. No biggie. It comes off pretty easily. If neccessary, remove the Circulation Water Pump from the front of the block to allow for the removal of the upper Main Bracket bolt. Use your slotted screw driver or 5/16" nut driver and loosen the clamps to the two water hoses on the back of the Raw Water Pump. Try to pry off the hoses without destroying them. If the boats in the water don't forget to install and secure a plug in the water intake hose. Removing these two hoses from the back of the pump can be difficult. Sometimes it's better to get the pump pulled away from the engine first. Remove the bolt from the port end of the Brace. This bolt is located on the port front side of the block. Remove the lower bolt from the Main Bracket and lift the pump out of the bilge. You should now have the entire Raw Water Pump Assembly along with the Main Bracket and the Brace in your hand. Go into your garage or shop and grip the pump by the Main Bracket in your large vise with the hose fittings facing straight up. Scribe marks on the pumps housing down to the Main Bracket as so you will be able to align the pump to the Main Bracket during reassembly. Don't clamp the pump itself or the pumps pulley in the vise or you will damage it. Remove the five screws that hold the rear pump housing to the front pump housing and remove the rear housing assembly. The impellar might come off with the housing, that's OK. Pop the impellar out of the housing and give everything a good inspection. NOTE: You will not have to disassemble the shaft, bearings and seals from the "nose" housing. Just leave all that together unless you feel the bearings or seals are bad. Refer to the Shop Manual if you decide to rebuild the nose housing. NOTE: Some changes have been done to the pumps over the years. Older style pumps had multiple layers of parts on the rear of the pump. The old style tended to leak at the gaskets. 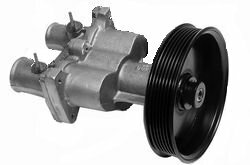 Mercruiser improved the pump by using a single rear housing section. 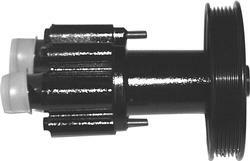 The new style pumps are less likely to leak and they are easier to build. If you have an older style raw water pump, you will be buying the Raw Water Pump Upgrade Kit. This Kit will replace all the old style multiple layers as so you will have the improved one-piece rear section. The latest pumps which are used on the 496 and MX 6.2L engines are different yet (see image). Assembly is the opposite of disassembly. Grease up your new impellar. Make sure your oring is in place. Place the impellar on the shaft with a new key. Grease up the inside of you impellar housing. Lower the housing down over the impellar while turning the pulley in the correct direction. Install the fasteners being careful not to over-tighten them. Install the pump onto the engine and your done! Mercruiser makes the best Raw Water Pump Assemblies. one piece style all plastic housing. applications including Alpha One, R, and Alpha Gen 2 models. 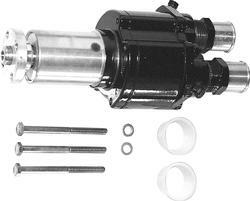 Fits GM V6 & V8 (454 & 502 cid) Gen VI engines with v-belt and electric fuel pump. 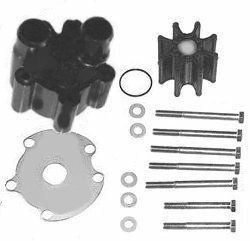 Fits GM V6 & V8 engines with serpentine belt and electric fuel pump. Fits MCM and MIE 4.3L MPI, 5.0L MPI, 350 Mag MPI and MX 6.2L MPI with ECM 555. Fits V8 engines with v-belt. Nose is machined for clamp-style bracket. 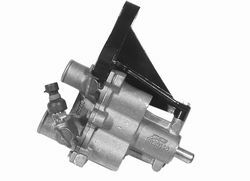 Fits GM V8 (454 and 502 cid) Gen V and VI engines with mechanical fuel pumps. Fuel pump mounts to the water pump. Fits MCM 496 Mag and HO and MIE 8.1S and HO.